I love my frying pans, there is really no need to use oil. Clean up is a breeze! Working really well for us. Perfect sizes for all my needs and so far they perform as expected. Still nice and white and cooks foods with an even heat. I needed a small pan for cooking one egg and the price of this set gave me 3 pans for only a little bit more than what I saw for a single pan. Very happy with this purchase. We really Love ceramic frying pans. This set was dented and mishaped most likely from shipping because there was nothing in box but frying pans. Bubble wrap would have saved them. Wife needed new pans but this time wanted ceramic do to her research indicating these are better for you when cooking. She received these earlier than expected and immediately went to use. Great quality and good price. Good for me. Thanks! Great, quality product. 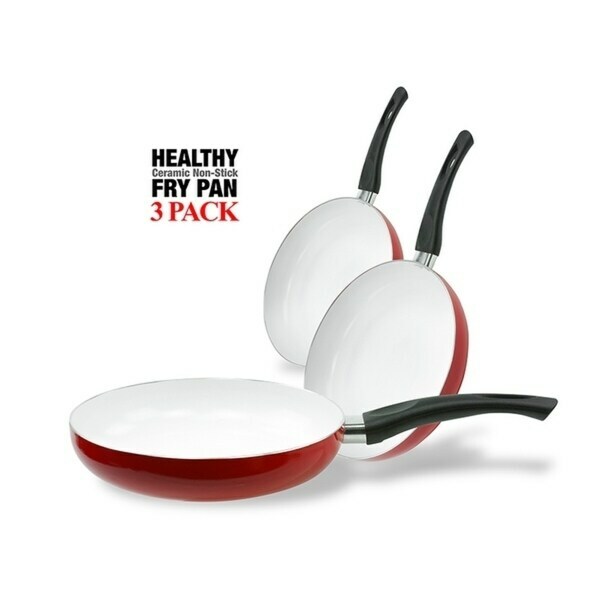 Non-stick, ceramic no worries about anything peeling off and getting in your food. I will be ordering another stat for my daughter-in-law. Great item for the price. Easy to clean, and nice vibrant color. I totally recommend this set. Great gift idea! There was a slight delay with the delivery. I'm not sure why. They were advertised as 2 day shipping. However. they took longer to arrive. Other than that I am happy with my purchase.